The Spanish national team did not have many chances in its last game against Russia, a solid team that has dominated basically through its running game. The game started with Russia focusing on the running game, a good job done by the offensive line and a great performance of Alwksey Medvedev that has scored 4 touchdowns today. His first score came with a 21 yard run. After the extra point conversion, the result was 7-0. Russia did not stop pushing and score again before the first quarter ended. Alwksey Medvedev found the end zone again. The second quarter was a copy of the first one, with Russia trying to show that he could have done more that just winning one game in this championship. Spain start moving the ball but could not add any points to the score table. Russia scored twice again before the half, again Alwksey Medvedev and Svytoslav Neskubin make things harder for Spain. The result was 26-0. 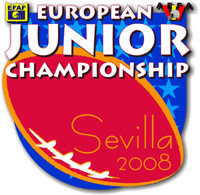 In the second half the Russian team, after another score of Alwkesey Medvedev, relaxed and let Spain began to move the ball what made possible for Spain to score his first touchdown with a pass from Mat Jonsson to Oriol Serrano. After that was Russia who score one more time by a rush from Ivan Lapikov. Last quarter was a copy of the third, Russia score twice one with a run from Denis Datzcalovich and a field goal from Vyacheslav Ignatev, and Spain score through Jordi Burgani fcatching a pass from Sergi Gonzalo. The final score 14-49.